It was a wonderful refreshing sight when I saw this beautiful quilt arrive in my inbox. Joanne from Armstrong, BC, Canada had recently purchased my pattern "Color Connections" and wanted to share a photo of her finished quilt. 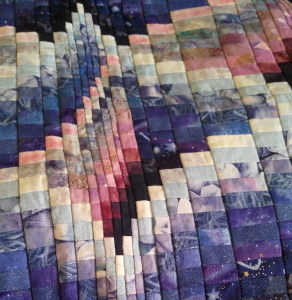 So here is a preview of the quilt I've been working over the weekend. It is almost complete with only some quilting to finish off and if it had not been for the interruption, I would have finished it! It has taken me just 2.5 days to complete so a perfect weekend project. The “Night Owl” is the second in a series of bird wall hangings by Anita Eaton.